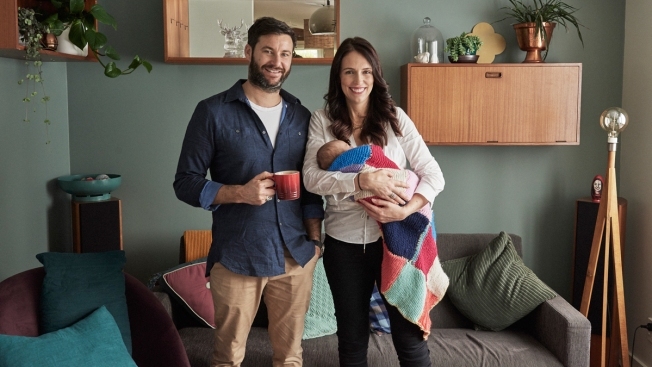 In this handout photo provided by the Office of the Prime Minister of New Zealand, Prime Minister Jacinda Ardern and partner Clarke Gayford pose with their baby daughter Neve Gayford at their home on August 2, 2018 in Auckland, New Zealand. New Zealand Prime Minister Jacinda Ardern has returned to work after six weeks of parental leave with her newborn daughter. "The last six weeks have been wonderful, not only because of the birth of our healthy daughter, but because we have been gifted by this cabinet, by the people of New Zealand, this time together and I know that that was guarded by this Cabinet but also by yourself, Minister Peters. So thank you so much," she said. In interviews last week, Ardern said the experience of focusing on her daughter's basic needs helped her appreciate why people with young families may not find time for politics and that it's the government's responsibility to serve people, whether they are engaged politically or not. She said that as she came to the end of her leave, she was anxious to demonstrate that she and her partner Clarke Gayford, who will become Neve's primary caregiver, can create a routine that works.